New LATTC student flyover animation of Crenshaw/LAX Line! LA Trade Tech Community College (LATTC) students recently worked with Metro to create a conceptual flyover rendering of the Crenshaw/LAX Line, which is under construction and more than halfway complete. The students’ video of the future 8.5-mile alignment and its eight new stations can be seen above. Metro Board Member Jacquelyn Dupont-Walker — an appointee of Los Angeles Mayor Eric Garcetti — helped bring the school and Metro together to produce and refine the video. The flyover begins on the north end of the line at Expo/Crenshaw Station and takes viewers south down Crenshaw Boulevard, turning west along Florence Avenue and then south along Aviation Boulevard, where the line will tie into the existing Metro Green Line. The animation slows along the way to highlight conceptual versions of the eight stations that will be part of the Crenshaw/LAX Line. This flyover video is a first step toward creating community labs for stakeholders to develop videos of concepts they have for projects. Production of this video was also aimed at providing students with real world use of technical applications typically used in bachelor degree programs. The idea is to help technical college students grasp architectural and engineering concepts early and encourage more students to pursue advanced degrees in architecture, planning and engineering. Metro needs to attract, develop and retain a world class workforce to plan, design, build, operate and maintain our local transportation systems. Metro thanks the students for their hard and excellent work on the simulation, with additional thanks to Architecture Professor Marcela Oliva and technical AIA Director Michael Rendler for their guidance on the effort. “This technology is rapidly being applied as a construction asset which creates ‘as builts’ during construction and makes systems easily accessible to multiple trades on the job,” said Dupont-Walker. The Crenshaw/LAX Line is expected to be complete in fall 2019 and construction is underway along the entire alignment. You can view photos from our most recent construction update here. Nice. 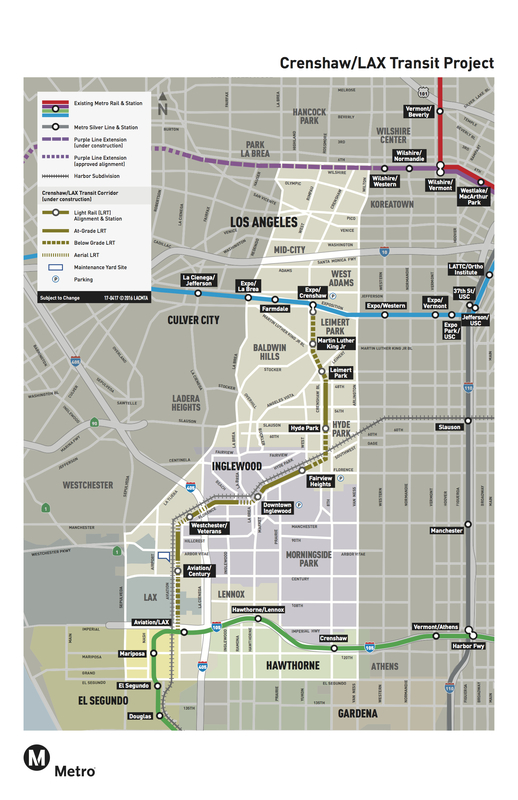 It’s still too bad they did not create a way to directly connect with the Expo so LAX to DTLA can be done without a transfer. At least at Expo/Crenshaw, it does not require a street cross, I still think it not not very safe for airport passengers to transfer there, especially at night. The other alternative (green/blue) is just as bad. I will still be taking Flyaway when I come into town. You think its bad to transfer there? ?